Classroom Freebies Too: Free Listening Directions Activities! I realize that following directions skills take some practice, like any other skill students need to learn. They have to be continuously practiced. So, I created a fun little product that does focus on those listening skills! It is called Following Directions in the K-2 Common Core Classroom! 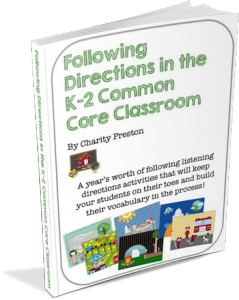 Want your free sample of Following Directions in the K-2 Common Core Classroom?